In class, we have been discussing and deconstructing the idea of wilderness. Growing up I would have described wilderness as a place with no humans, where wild animals live, and outside of the city. This class has now opened my eyes to why that view of empty of land (wilderness) is problematic. 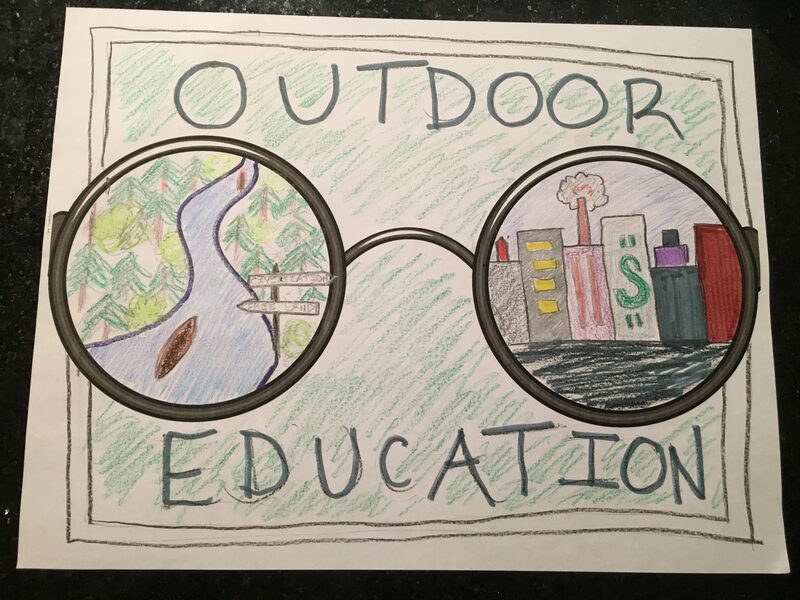 For my creative visual I wanted to illustrate the conflicting views I was taught in school regarding outdoor education. My visual piece is a set of glasses looking at a chalkboard with the heading “OUTDOOR EDUCATION”. In one lens you see a very commonsense photo of what wilderness is and the other lens is a city skyline. I wanted to represent how schools teach us to put the economy before anything else and how nature/wilderness is treated as only an escape or place of recreation. This way of teaching is problematic because it reproduces the binaries: civil vs. wild and culture vs. nature. In an assigned reading “Canoe Pedagogy and Colonial History: Exploring Contested Spaces of Outdoor Environmental Education” by Liz Newberry, Newberry further explains why outdoor education plays a role in reproducing and enforcing colonialism. In one line she explains that “[i]n dominant and colonial images of wilderness, Aboriginal presence is either erased or Aboriginal people are themselves recast as nature.” Thinking of my own outdoor education experiences growing up I do not remember learning about any First Nation, Metis, or Inuit people. This is a problem because it made me believe that there are empty lands and lands that have no other context than what I was seeing. Going through the education program and going to treaty education camps I have fortunately gotten to unlearn many colonial views. I look forward to continuing and sharing my education. This entry was posted in ESCI 302 and tagged colonialism, education, outdoor education, science education, treaty education by alexjtaylor16. Bookmark the permalink. I really liked your creative visual and how you decided to represent the different views of outdoor education and how it’s taught. I also fully agree that this way of teaching young students about the the environment and the world is problematic and needs to be addressed. I think this may start to change a little bit due to the increase in Indigenous education and more teachers teaching in new ways. I had a good amount of Indigenous education throughout my schooling so I had more knowledge about the land and did not see it as empty but I can see why most people would think that with barely any Indigenous education.